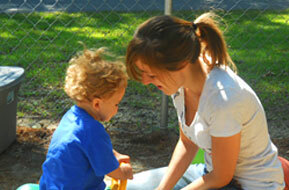 One-on-one relationships with a caring, responsive adult are vital to your child’s early brain development. These relationships provide babies with security and encouragement to venture out in to the world. Our childcare teachers take their cues from each child and plan the environment and daily routine based on individual needs, temperament and preferences. Young children need a rich environment with lots of opportunities to see, hear, touch and move. Teachers and children sing songs, explore appropriate art materials, read books, and play games. Weather permitting, time is spent outside each day. Teachers use simple sign language with children to foster and develop verbal communication. Teachers create a language rich environment by talking with children about everything that is happening throughout the day. Meet our teaching staff here. We value the importance of children spending time outdoors. Staff provide a balance of free time for exploration as well as more structured activities that promote physical development, curiosity, and investigation of the natural environment. Teachers work closely with parents on providing nurturing care for each child. Parents are welcome to visit the classroom and contact teachers throughout the day. Teachers also complete daily charts for each child. These charts include details about eating, sleeping, activities, and developmental progressions. To inquire about openings for your child, please contact us here.